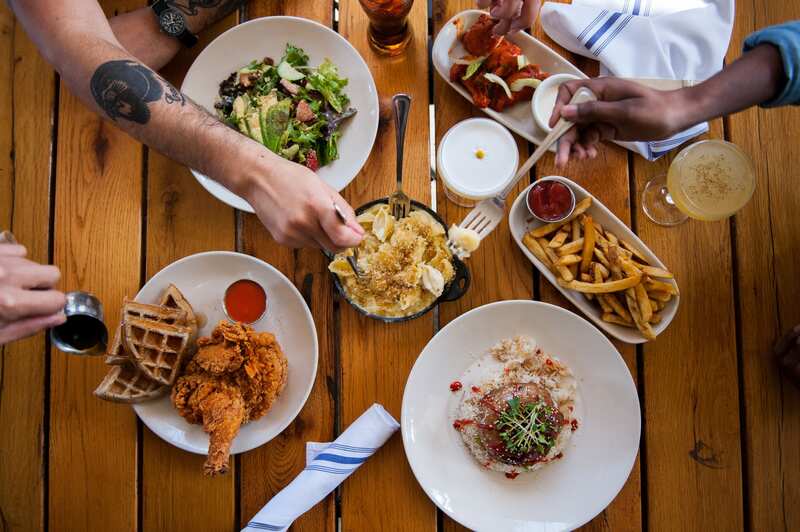 Located in the heart of Los Feliz, Messhall Kitchen celebrates regional American dining. We serve up brunch, lunch and dinner - featuring daily specials and fresh oysters. Our culinary team re-conceptualizes American favorites using local, sustainable, organic and seasonal ingredients. Our innovative bar program features fresh and seasonal ingredients, supporting local farmers, brewers and distillers. We proudly maintain a carefully curated spirits collection with heavy emphasis on classics, small batch spirits, and craft beers. Messhall stands in the storied walls of what was once Willard's Chicken Inn, and later The Brown Derby. During the "Golden Age of Hollywood," legendary film director Cecil B. DeMille bought Willard's Chicken Inn, a country-colonial chicken restaurant, and quickly turned it into the "it" place to be for Hollywood's elite. The building's unique dome-shaped roof allowed for a water pumping system that made it one of the first air conditioned restaurants. The structure was designed by influential architect Wayne McAllister, credited with creating some of the most popular mid-century drive-ins and car hops. After Willard's closed in 1940, the Los Feliz Brown Derby Restaurant opened on the site as a 24-hour Drive-in Car Cafe, and remained popular till the '60s. Messhall is now one of architect McAllister's only original designs still standing.